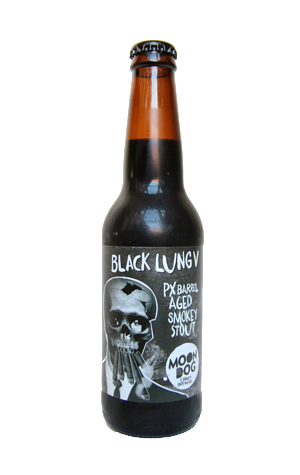 Ever since the first Black Lung staggered out of Moon Dog's brewery, coughing and spluttering its way into the world, it's been the annual release from the brewery we look forward to the most. Indeed, Jumping the Shark 2013 apart, its first and fourth iterations are probably the pick of everything they've released here at Crafty Towers. With the beer picking up the Champion Stout & Porter trophy at last year's inaugural Craft Beer Awards, it has plenty to live up to as well. Once again, the beer is an imperial stout featuring a hefty proportion of heavily peated malt that's spent time in oak. This time around, the weapon of choice was Pedro Ximenez barrels and, once again, the result is a damn fine beer. The sherry character that once must have inhabited the barrels struggles to make much of an impact – hardly surprising given what it's up against. But that doesn't diminish Black Lung V at all. The familiar gelatinous black body gloops its way into your glass and unleashes the equally familiar array of ashtray, dark chocolate, smoky, roast and bitter goodies, along with a touch of fruity, fortified booze. For a beer with such a wonderfully rich body – one that lingers long after it's made its way down your gullet – it's remarkable how easy it is to want for a second as the first finishes. The only conclusion to be drawn is that, in combining all the boisterous ingredients that go into it, the Moon Doggers hit upon a rare balance. Roll on number VI!